Hot tenting! Glorious hot tenting. 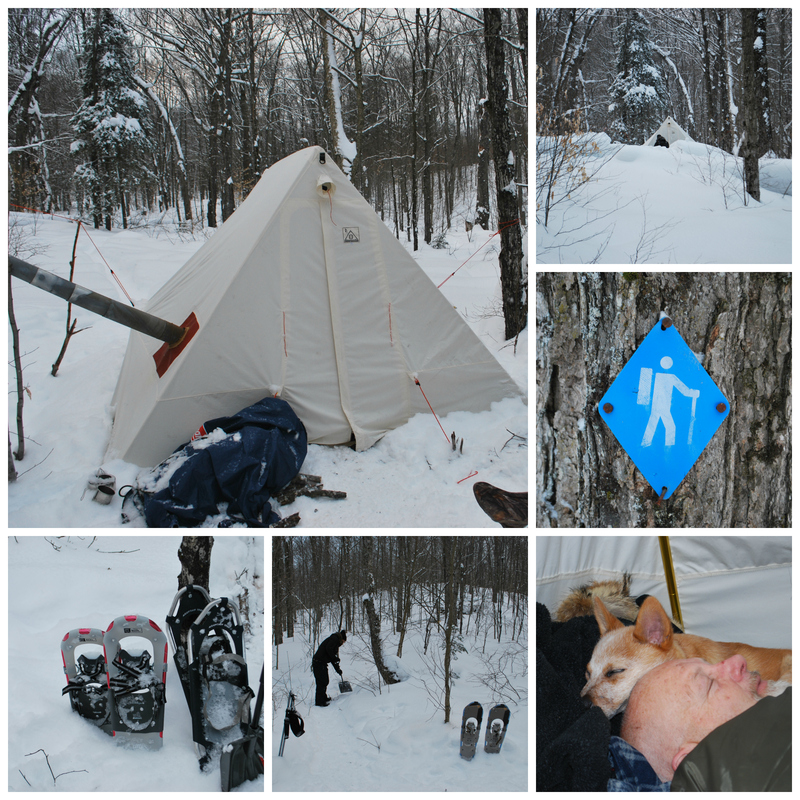 It’ll be pretty hard to convince this guy to ever again go winter camping without a hot tent again. 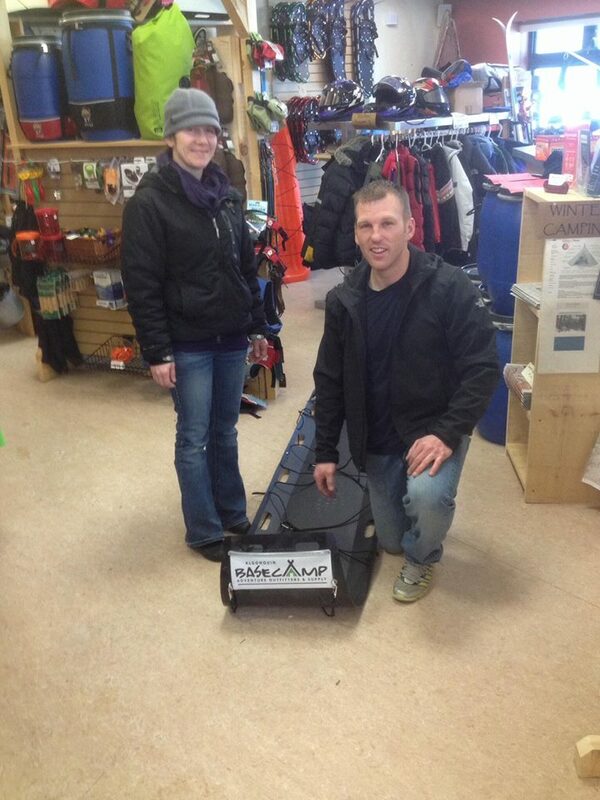 On January 31 2014 Team Paddle In set out for five wonderful days in Algonquin’s interior. 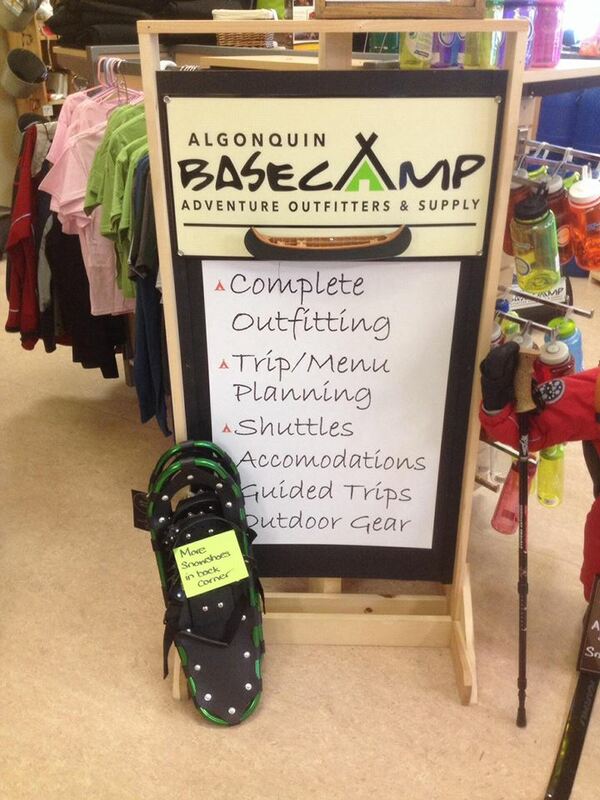 But first we made a stop at Algonquin Basecamp. Chris and Robin were absolutely great to deal with. We strongly recommend them they have a wonderful outfitting store located near Access point 4 at the Amalguin Highlands information center. Lots of cool gear to rent or buy we’ll definitely be back. Chris ran us through the basic safety and setup of the SnowTrekker, we paid for our rental and we were off into the park. Okay before we get into set up let me give you some stats on the SnowTrekker. Sounds pretty amazing doesn’t it? It is! It really is. This tent went up so fast. Simple A-frame design made set up a cinch. Both the stove and tent fit onto one pulk which made carrying it in a snap. Have you set up an A-frame before? It’s very easy. Having some extra hands while setting this up makes it go much faster. Wait stop! Did you pack down the area you wanted to set your tent up in? Get those snowshoes working. Stomp ,stomp, stomp. make a larger area than the tent so you have room to walk and work. Make a path of into the bushes as well for when nature calls. Trust me you don’t want to be walking around in the middle of the night, up to your waist in snow and only wearing your long johns. Okay, have a nice area packed down? Take a break have a snack, gather some firewood. When you come back it should of already started to freeze. Lay your poles out. Find your center pole and the four legs. This is where we found having someone there to help you was great. Have one person begin to insert legs. While the other person holds up the center pole. 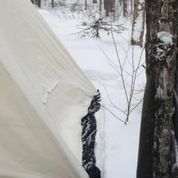 As Chris from Algonquin Basecamp stated the tent acts a bit like a baby deer, all wobbly on its legs until you get the canvas on. Once all your legs are on go grab the canvas. Insert legs on either side into the pockets at the corner of the canvas. Pull the canvas over the frame and insert the legs on the other side into the pockets in the canvas. Voila! That’s pretty much it. 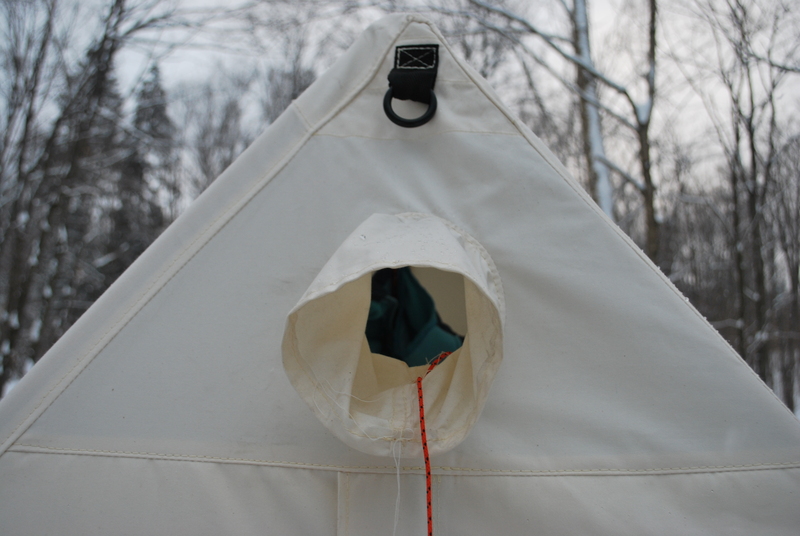 Side poles can be installed and the tent can be pulled out using grommets and string at all four sides. You’ll notice a black snow liner around the bottom. Its up to you if you want that inside or outside the tent. I have seen people do it both ways. We kept ours on the outside. The 15cm of snow we received the next few nights covered it and created a nice “seal” to the ground. No drafts coming in at all. 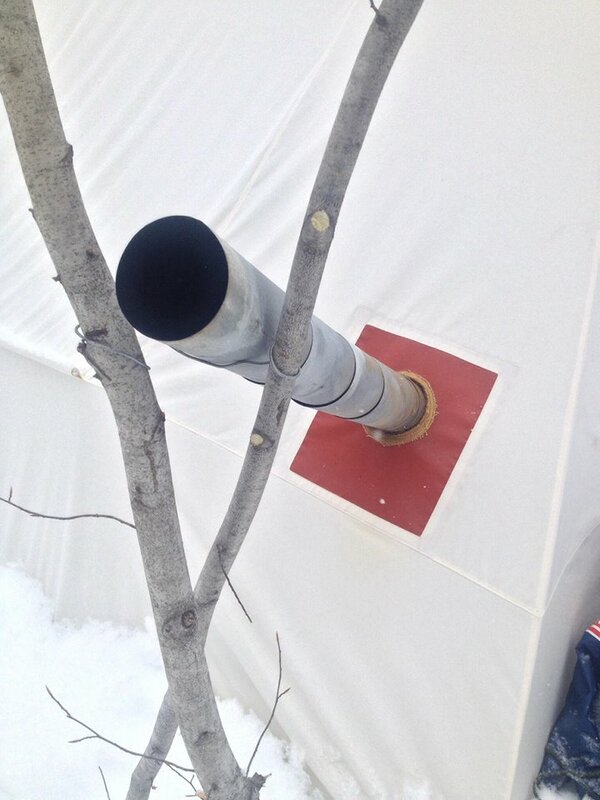 Open the vents at the top of the tent and you’re set. Okay stove time.Pull open the legs, now stop. A major concern is that you keep your stove level and stable. 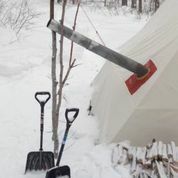 This is accomplished very easily by creating a float with logs underneath it (pictured below) These can be wired to the legs and to each other with small gauge wire. 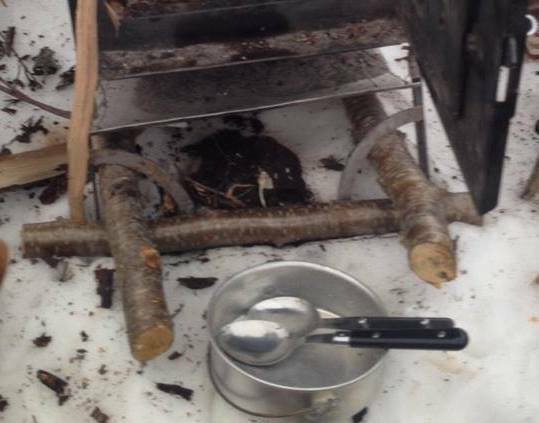 Okay depending on which tent you have and what level the stove it at the next steps include putting the elbow stove pipe in and then placing the nesting stove pipe into the elbow. Don’t ram it in. It fits very nicely and the pipe is thin metal and can be damaged by to much force. Ok you’ll need a bi-pod or tri-pod. Go grab some nice sticks and slightly heavier gauge wire (Thanks again Chris). Make yourself a sling to hold the pipe up. Like so. See those little shovels up there? Its a good idea to keep one of them inside the tent. This way if there is a fire or something is heating up to much. Snow can be scooped and dumped very quickly. A word of warning. The pipe gets HOT! (really a stove pipe Matt?) Yes it does. So make sure you are wary when lumbering around your campsite like a bear. Now it should look something like this. Now go get more firewood lot of it if you want to stay warm. The 10×13 EXP Crew was more than enough space for the Three of us and two dogs. We had a nice kitchen area near the stove. Gear stowed to the side and all our sleeping bags laid out with our feet pointing toward the stove. With the stove stoked and filled we could damp it down and enjoy the warmth while we ate dinners and talked about mysyery adventure survival novels about guys named Devon (don’t ask). When night came we let the fire die out and then tucked in to bed. The stove was never run unattended. If someone was cold, they got up stoked the fire had a drink and sat around. You don’t want a tent full of smoke or a fire on your hands. So if no one is awake/around to watch it don’t run it. Believe me the tent will heat up. I was amazed at the temp difference that was created by that stove. Its great to be able to dry wet gear and just warm yourself up. In closing we want one of these tents. They would be great for any type of base camp camping. Late fall trips, early spring trips and dead of winter trips would all benefit from having one of these amazing tents along for the ride. if you haven’t tried hot tenting get out there. the groundhog said six more weeks of winter. Enjoy and have fun. Be safe and gather lots of wood. These particular photos were taken on the western uplands backpacking trail. 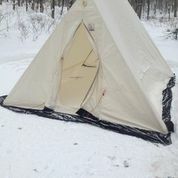 We also hot tent in the Rain lake area of Algonquin as well.